ABBYY Lingvo is a powerful translator with which you'll be able to know the translation and the meaning of any word or sentence. This version of the application translates English, German, French, Spanish and Italian. As well as being very easy to use, you will be able to check the translation of words that you find on the Internet using simple keyboard shortcuts. Download ABBYY Lingvo to make sure that language isn't a hindrance when trying to understand any contents. 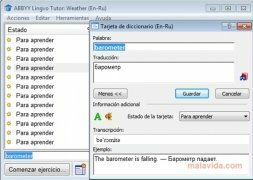 This dictionary and translator has several functions, that will allow you not only to know the translation of a word, but also its definition. You can check a word by introducing it in the search engine. In a few seconds, you'll obtain its translation to the chosen language and a full definition. Furthermore, you can learn how to pronounce it, its origin and see examples of how it is used. The fastest and most accurate translations for Windows. ABBYY Lingvo also allows you to check the meaning of the words while you browse the Internet. You'll only have to select them and use the Control + C shortcut. 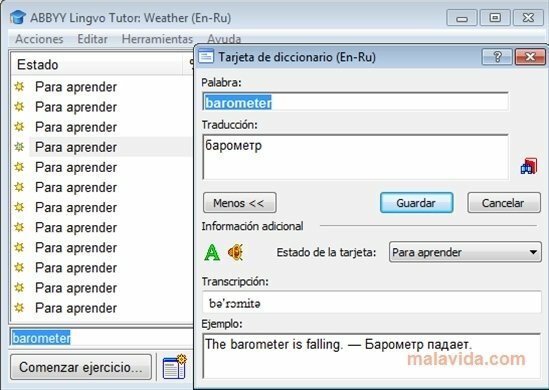 Another useful function included in ABBYY Lingvo is the Lingvo Tutorial, a tool that will allow you to learn vocabulary in a foreign language. To do so it asks the user the translation of certain words. The trial version can only be used for 15 days.